Coral reefs are characterized by the coral structures that provide habitat for the fish and invertebrate species that make up a significant amount of the ecosystem. Hard corals create the reef itself and they typically consist of a layer of colonial polyps that live on the surface of a calcium carbonate skeleton that is secreted by the coral polyps. Corals rely on a symbiotic relationship with the zooxanthellae algae which can be found in the gastrodermis in the "stomach" of coral polyps. Zooxanthellae photosynthesize while residing inside their host, and provide the necessary nutrients and energy for the invertebrate host, transferring 95% of their production. (Muscatine, 1990). In return, corals supply zooxanthellae with nutrients essential for photosynthesis such as ammonia and phosphate from their waste metabolism. These nutrients seem to be essential for the survival of the zooxanthellae because the water column in the tropics is usually devoid of essential inorganic compounds (Trench, 1979). Shallow coral reefs are found in clear, tropical waters with temperatures around 70–85° F or 21–29° C. Temperature, salinity, nutrients, aragonite saturation state, and light are among the most important factors in controlling the geographic distribution of shallow-water coral reefs (Couce et al., 2012) (Kleypas et al., 1999). The global, annually averaged tolerance limits for coral reefs are 21.7—29.6 °C for temperature, 28.7—40.4 psu for salinity, 4.51 μmol L-1 for nitrate, 0.63 μmol L-1 for phosphate, and 2.82 for aragonite saturation state. The averaged minimum light intensity in coral reefs is 450 μmol photons m-2 s-1 (Guan et al., 2015). 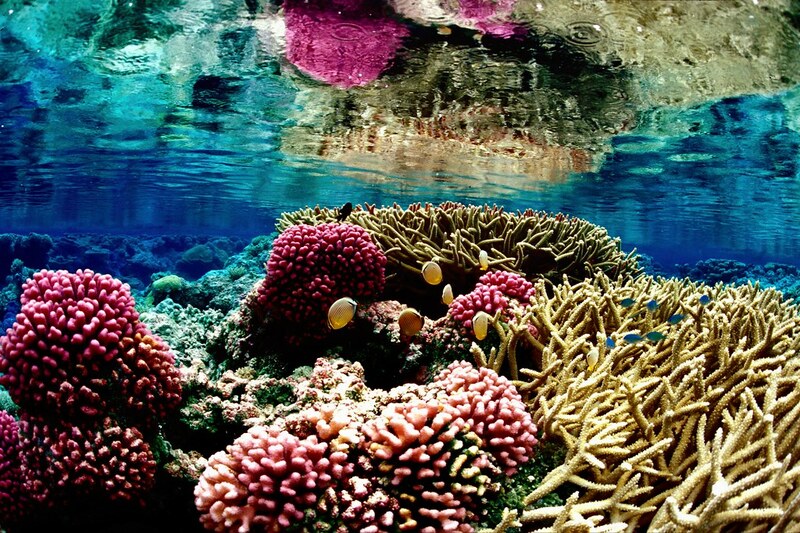 Coral reefs have become one of the most vulnerable ecosystems to climate variation and change. Corals, the building blocks of carbonate reefs, have a restricted thermal tolerance, resulting in ‘bleaching’ events (loss of symbiotic algae) when sea surface temperatures rise above a given threshold (Graham et al., 2008). Sea temperatures in tropical regions have increased by 1°C over the past century. These increases in temperature can trigger events known as coral bleaching, where the thermal tolerance of corals and their photosynthetic symbionts, zooxanthellae, are exceeded (Guldberg, 1999). Please see section X.X for additional information on coral bleaching. Figure 1. Depicts a reef where a number of the corals have been bleached. Other substantial influences for coral reef degradation also exist. Specific factors such as eutrophication, increased sedimentation, tourism, and increased fishing pressures may interact with climate change to produce negative synergistic effects (Wilkinson and Buddemeier, 1994). Degrading reefs undergo a phase shift in which the abundance of corals decline and switches to an increase in abundance of larger fleshy macroalgae (Done, 1992). The main drivers that have been cited to explain such a shift is primarily from eutrophication (Lapointe, 1997) and reduction in herbivory (Hughes, 1994). Eutrophication is mainly caused by high nitrogen and phosphorous runoff from agricultural lands that seep into the ocean. The increased nutrient load creates an optimal environment for the production of macroalgae, which is a direct competitor with coral reefs since they decrease the total amount of available light for zooxanthellae to photosynthesize. Intense feeding by herbivorous fish and sea urchins favor coral ecosystems by excluding the presence of macroalgae. Increased fishing pressure has reduced the number of herbivorous fish by orders of magnitude, estimated at around a 60 % decrease (Jackson, 1997) (Bellwood et al., 2004). Due to this reason it is essential to conserve species specializing in herbivory if our goal is to preserve coral ecosystems (Adam et al., 2015). Adam, Thomas C., et al. "Herbivory and the resilience of Caribbean coral reefs: knowledge gaps and implications for management." Mar Ecol Prog Ser 520 (2015): 1-20. Bellwood, David R., et al. "Confronting the coral reef crisis." Nature 429.6994 (2004): 827-833. Couce E, Ridgwell A, Hendy EJ (2012) Environmental controls on the global distribution of shallowwater coral reefs. J Biogeogr 39: 1508–1523. Gattuso, J.-P., Frankignoulle, M., Bourge, I., Romaine, S., and Buddemeier, R. W. (1998). Effect of calcium carbonate saturation of seawater on coral calcification. Global Planetary Change 18, 3747. Graham, Nicholas AJ, et al. "Climate warming, marine protected areas and the ocean-scale integrity of coral reef ecosystems." PLoS One 3.8 (2008): e3039. Guan, Yi, Sönke Hohn, and Agostino Merico. "Suitable Environmental Ranges for Potential Coral Reef Habitats in the Tropical Ocean." PloS one 10.6 (2015): e0128831. Hoegh-Guldberg, Ove. "Climate change, coral bleaching and the future of the world's coral reefs." Marine and freshwater research 50.8 (1999): 839-866. Kleypas JA, McManus JW, Meñez LAB (1999) Environmental Limits to Coral Reef Development: Where Do We Draw the Line. Am Zool 39: 146–159. Muscatine, L. "The role of symbiotic algae in carbon and energy flux in reef corals." Ecosystems of the world 25 (1990): 75-87. Trench, R. K. (1979). The cell biology of plant animal symbiosis. Annual Reviews of Plant Physiology 30, 485-531. Wilkinson, C. R., and Buddemeier, R. W. (1994). Global climate change and coral reefs: implications for people and reefs. Report of the UNEP- IOC-ASPEI-IUCN Global Task Team on the Implications of Climate Change on Coral Reefs. IUCN, Gland, Switzerland, 124 pp.